This short film is a preview of another one, more developed. Or maybe not, it could remain a haïku. La consultation de la vidéo se fait uniquement sur demande. Si vous souhaitez la voir, veuillez m'envoyer un email, en retour je vous transferrais un lien pour la regarder. The self-portrait is an academic representation trying to say the essential. During Renaissance the subject himself and its appearance was the main topic, a centripetal concept in fact. I rather prefer to suggest the diversity of a person, and of things we do not see: the perception, the thinking... So in this video, I do not perform with my body, I perform with perception, theory and immateriality. I am referring to persons from the early 20th century, which is the time of the beginning of modernity, their thoughts were completely broken away with classical era. 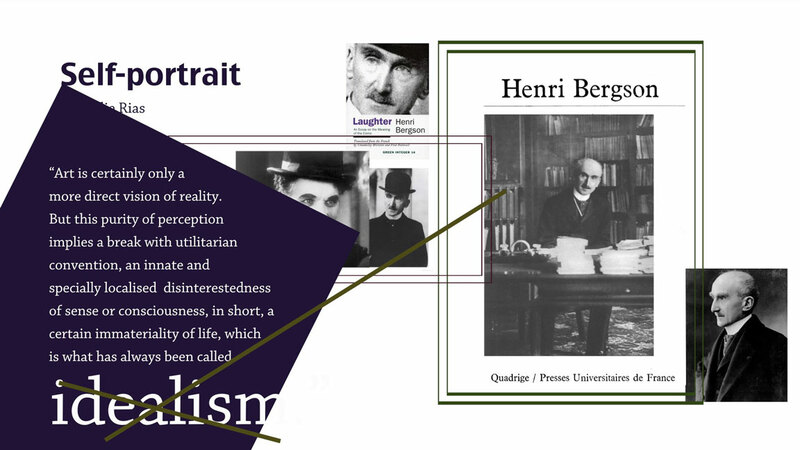 They are: Henri Bergson in philosophy, Albert Einstein in science and Marcel Duchamps in art, I also use a picture of an hysteric person in relation with the beginning of psychoanalysis at the same time. If I mentioned these persons, it's not to compare them to me. I play with them, I refer to them and I detach myself. This self-portrait does not attempt to create a clear figure, it plays with sensitivity and makes some relations, sometimes without resolution, beyond a direct understanding.